Why would I need self storage in Rochelle Park, NJ? There are a variety of reasons why you might need self-storage in Rochelle Park, NJ. How much is a storage unit in Rochelle Park, NJ? The cheapest storage unit in Rochelle Park, NJ is $77.00 per month. What size storage units do you have available in Rochelle Park, NJ? In Rochelle Park, NJ we have sizes that range from 5'x5' to 10'x20' to suit your storage needs. How much is it for a 5'x5' storage unit in Rochelle Park, NJ? The cheapest 5'x5' storage unit in Rochelle Park, NJ is $77.00 per month. Rochelle Park is a small township in Bergen County, New Jersey. It has a tiny geographical footprint of just over 1 square mile, and is home to a mix of families, single professionals and seniors. One of the biggest benefits of living in Rochelle Park is its proximity to New York City, less than a 20-mile drive. Rochelle Park has a long history of human settlement dating back thousands of years. While no one is certain who was the first human to set foot in what is now Rochelle Park, archaeological evidence suggests a nomadic tribe had a summer encampment in the area around 7,000 years ago. The Lenape tribe, eventually called the Hackensacks by the Dutch, once lived in the area. When European settlers arrived, they called it New Amsterdam for a while. However, because the Netherlands, Spain, France and England were constantly battling each other for a stake in this part of the New World, the name changed with each new possessor. During the Revolutionary War, the area changed hands many times and saw numerous battles. The British were eventually banished from the area, allowing residents to settle into life in the newly established United States. As life continued into the 20th century, residents began to disagree about which way the community should go. Many wanted better schools, street lighting, sidewalks, water, sewage and more. However, farmers from Paramus wanted to keep the area as simple farmland and didn't want to pay extra taxes. In 1922, the area split into two municipalities, Paramus and Midland Township. On Nov 5, 1929, residents voted 503 to 69 to change the township's name from Midland Township to Rochelle Park. Rochelle Park is a popular bedroom community for New York City, especially for people who enjoy a quiet, small-town lifestyle. The township is so small that you'll almost certainly feel a strong sense of community, fostered by the many local events. Rochelle Park hosts a number of special gatherings, including a Memorial Day parade, the annual Summerfest Oldies Concert, fishing derbies, movie nights and a holiday tree lighting. Rochelle Park also provides a variety of recreational programs for children and adults. Youth sports like softball, baseball, soccer and basketball make it easy for children to stay active, while summer camps and middle-school dances offer social activities. The Rochelle Park Senior Center hosts a senior citizens club that meets regularly for educational seminars, movie showings and group field trips. Local parks, a swim club and a few historic sites offer plenty to see and do in the township. Midland school No.1 in Rochelle Park, part of the Rochelle Park School District, serves students in pre-K through eighth grade. Secondary students attend Hackensack High School in nearby Hackensack, New Jersey. High school students enroll at one of the Bergen County technical schools. Utilities: Public Service Electric & Gas is Rochelle Park's energy provider, while the township manages its own water and sewer services. Garbage and Recycling: Garbage is collected weekly. Recyclables are also picked up once a week, alternating between collection of paper and cardboard and mixed recyclables. 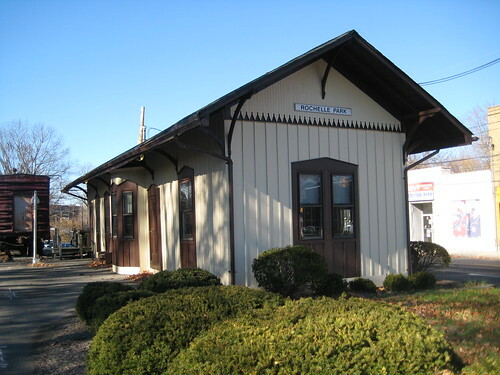 Transportation: Like many New Jersey communities, Rochelle Park is well-connected via the New Jersey Transit system. You can use the system to access major metropolitan areas near the township, including Manhattan. Because Rochelle Park is located so close to New York City, you can expect above-average housing prices. However, it's a much more affordable alternative to living in New York, whether you decide to rent or buy. Because it's a small community, the housing market is somewhat limited. However, there are still enough options to allow you to find something that fits your needs. Our lowest priced units in Rochelle Park, NJ average $77.00 per month. 55 people have reserved units in Rochelle Park, NJ in the past 30 days. There is 1 location within Rochelle Park, NJ's city limits. There is 1 location in Rochelle Park, NJ that offers AC and Heating features.